According to one enumeration, at least 145 people have been killed and another 437 injured as a result of railroad wrecks in Porter County, Indiana. Four wrecks, in particular, resulted in significant casualties. Three of these four wrecks were, in part, due to the lack of train crews' visual confirmation of signals, flags, and lamps. Blame for the Sandy Hook wreck (1887) in Boone Township was placed on a freight train engineer who failed to heed the warning of a trackside semaphore lamp indicating that a train was idle on the track ahead; dense fog was said to have made the lamp nearly impossible to observe. Heavy snow and wind played a significant role in Porter County's worst rail disaster at Woodville in Liberty Township (1906). The horrendous Porter wreck (1921), whereby a New York Central passenger train tore through a Michigan Central passenger train crossing its path, was blamed on the failure to observe a stop signal. The stop signal, however, was claimed to have been cloaked by smoke generated by another Michigan Central train standing idle on a sidetrack. The ability to visually observe a signal had nothing to do with the fourth major railroad wreck in Porter County. Instead, the motorman of an interurban train failed to heed a dispatch order. 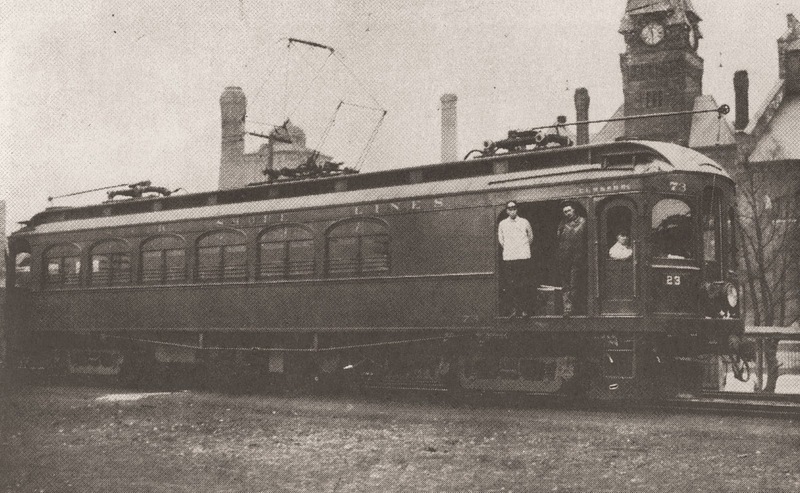 On December 2, 1901, the Chicago & Indiana Air Line Railway incorporated with the intention of connecting the Indiana cities of East Chicago and South Bend with electric trolley service. By 1903, the company had completed a 3.4-mile streetcar route between East Chicago and Indiana Harbor in Lake County. 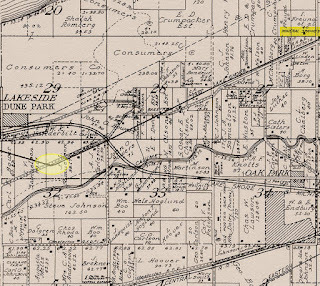 The golden age of interurbans was just beginning and the railway company reincorporated and recapitalized in 1904 as the Chicago, Lake Shore & South Bend Railway, commonly referred to as the Lake Shore, to better reflect the region that it intended to service. The Lake Shore continued extending it service eastward. Ten trains per day were operating between Hammond and South Bend by September 1908. Before the end of that year, the Lake Shore had extended its service westward into Chicago. Chicago service was achieved by leasing the Illinois Central Railroad's Kensington & Eastern Railroad line between 115th Street in Chicago to the Illinois-Indiana border. On July 1, 1909, a passenger could travel continuously without transfer from Chicago to South Bend on the Lake Shore line; the cost of establishing the line between these two cities was $4.55 million [nearly $118 million in 2017 dollars], $2 million more than had been anticipated. In 1909, the Lake Shore interurban line was owned and operated by a syndicate headquartered in Cleveland, Cuyahoga County, Ohio. Cleveland banking professionals George Newcombe Chandler, Henry Payne McIntosh, Joseph Randolph Nutt, and Myron Henry Wilson were the trustees of the syndicate. 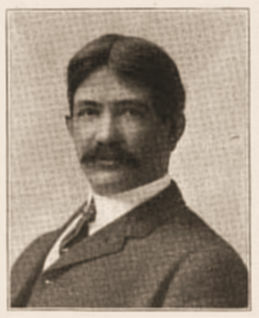 Harold Ulmer Wallace, formerly of president of the Wallace-Coates Engineering Company of Chicago and a graduate of Purdue University, was employed by the syndicate to serve as the Lake Shore's general manager. A few years previous, Wallace's father, John Findley Wallace, had been appointed by President Theodore Roosevelt as chief engineer of the Isthmian Canal Commission, the developers and builders of the Panama Canal. of the Chicago, Lake Shore & South Bend Railroad. Source: Electric Railway Review, 1908. June 18th and 19th, 1909, were extremely busy days for the Lake Shore. 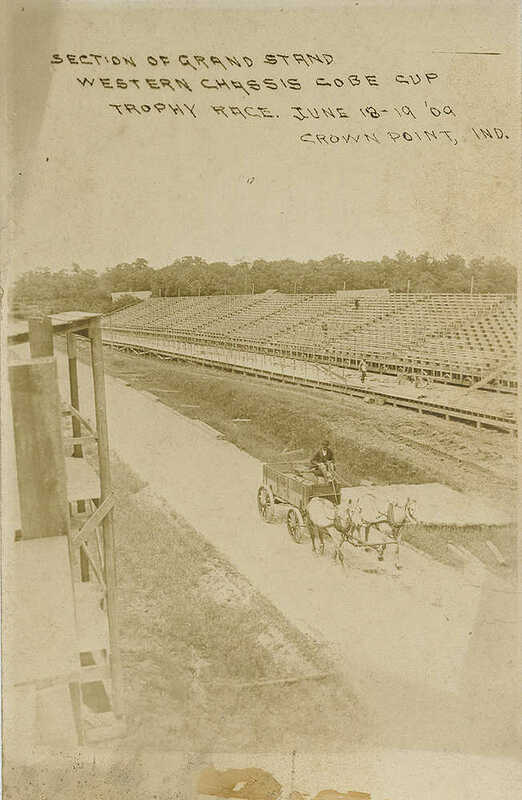 Ridership on the single-track line was at capacity since the Cobe Cup Race, the predecessor of the Indianapolis 500, was taking place in southern Lake County, Indiana. 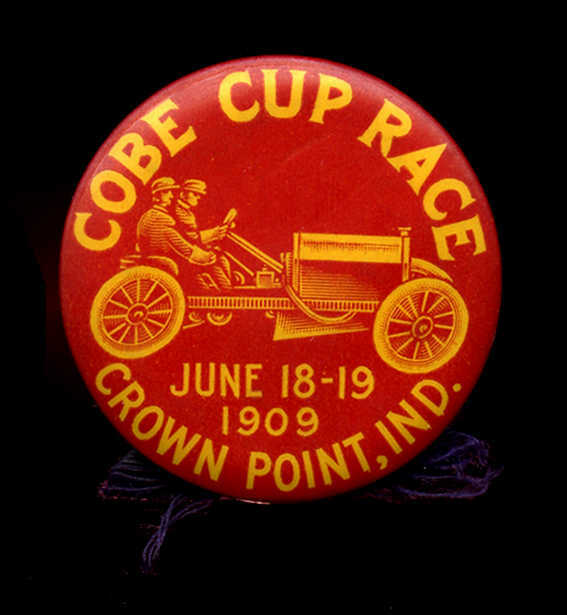 During the early evening of Saturday, June 19th, Lake Shore trains were transporting Cobe Cup spectators, who had earlier in the day witnessed Louis Chevrolet win the Cobe Cup Trophy, back to their homes. The chain of events that led to the collision at Shadyside in Westchester Township began at 7:55 pm when Lake Shore train No. 59, operated by Motorman George Andrew Reed and Conductor Delmar Kinney, departed the Pullman Station in Chicago for South Bend. When they arrived at the Gary station in Lake County, Indiana, there were more than 50 passengers on board the passenger car. Pinback souvenir from the Cobe Cup Races, June 18-19, 1909.
at Crown Point, Lake County, Indiana. Meanwhile, Lake Shore train No. 58, operated by Motorman Fred Schimmel and Conductor E. A. Pahl, had departed South Bend at 7:02 pm headed westbound for the Chicago station at Pullman. The time card schedule for train Nos. 58 and 59 indicated that they would meet at Long Lake at 8:55 pm. Long Lake is situated directly south of the Indiana Dunes National Lakeshore's West Beach parking facility, immediately southwest of Ogden Dunes in Portage Township. 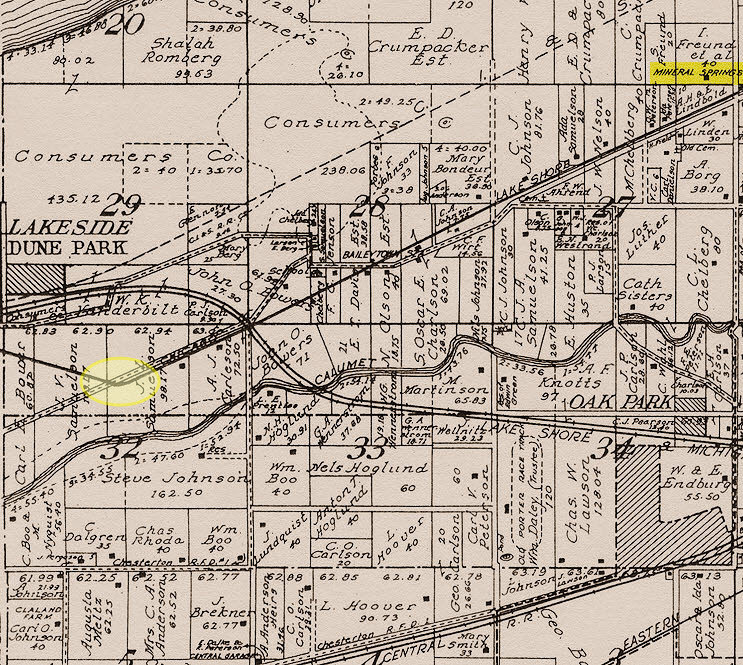 Since the Lake Shore was a single line track, one train would take to a sidetrack at Long Lake while the other proceeded past on the main line. Westbound train No. 58, however, arrived late at its Franklin Street stop in Michigan City. As a result, the Lake Shore dispatcher relayed to the agent at Michigan City an order that train No. 58 would meet train No. 59 at Wilson located 3.4 miles east of the scheduled Long Lake stop. The order was passed on from the station agent in Michigan City to the train's crew. Eastbound train No. 59 had arrived slightly late into the station at Gary. In addition, Conductor Kinney was ill and had requested to be relieved at Gary. Though Kinney had expected a substitute to replace him, there was no Lake Shore conductor available at Gary to do so. The Lake Shore dispatcher, being made aware of a situation in flux between the two trains, issued to the agents at Gary and Michigan City three separate and distinct orders; each subsequent order extinguished the dispatcher's previous order. The first order stated that train No. 58 would purposely run 25 minutes behind schedule. The second order was that the two trains would meet at the Mineral Springs stop in Westchester Township. The third and final order was that the two trains would meet at the Wilson stop in Portage Township, which was identical to the earlier order received by train No. 58 at Michigan City. Conductor Kinney received the dispatcher's third and final order from the Lake Shore station agent at Gary, which he was required to relay to Motorman Reed. Thus, both trains departed their respective stations with a dispatch order to meet at the Wilson stop. At Dune Park, eastbound train No. 59 stopped to let a passenger disembark; Dune Park was located one-quarter of mile east of the Wilson stop. Hence, train No. 59 had already passed the ordered meeting point at Wilson. Train No. 59 reportedly started up rapidly when leaving Dune Park and soon collided with westbound train No. 58 at a sharp curve in the line at the Shadyside Crossing in Section 32 of Township 37 North, Range 6 West in Westchester Township. Springs Station in Westchester Township. Therefore, train No. 59 had already ventured more than one and one-eighth miles past the Wilson stop when it collided with train No. 58 shortly after 9:00 pm. Signs along the track were installed at points before the curve at Shadyside Crossing warning trains to slow to 30 miles per hour. Motorman Schimmel, operating the westbound train, apparently saw that an oncoming collision was going to take place and had fully stopped his train before the eastbound train, traveling more than 50 miles per hour, smashed into his train. Schimmel would later testify that he had even attempted to move his car backward before the collision, but the air brakes had not yet released the wheels when the impact took place. Motorman Reed and ten of his passengers on train No. 59 were killed and more than 40 others between the two trains were injured. Front page headline concerning the Shadyside wreck. Source: The Chesterton Tribune, June 24, 1909. No. 59 (Motorcar No. 73) is the passenger car to the right in this image. Nils Haglund, residing very near Shadyside Crossing, was one of the first individuals to arrive at the wreck and assist in rescue efforts. Haglund also telephoned to Chesterton requesting that Dr. Frank M. Axe be immediately sent to the site of the disaster to render medical aid. Chesterton undertaker John B. Lundberg was soon on the scene as well. Within hours, Lundberg had transferred all the dead to the fire engine room at the Chesterton Town Hall. business in this image. Thomas Centennial Park is to the right. Almost immediately after the collision, the nearby house of Emil R. Borg was converted into temporary hospital and morgue. The Borg family reportedly "assisted in having the relatives of the victims notified and the hospitals to which the injured were to be sent to prepare places for the patients." Another nearby resident, John Arndt, also rendered aid. These efforts were made difficult, however, since the only light available came from hand lanterns that were procured from residents living close to the scene of the accident. There were about fifty on our car. Most of us got on at Hammond, having been at the auto races at Crown Point. It seemed to me that the majority were from South Bend and Mishawaka. Tired out by the long day of excitement, many of the passengers were asleep. About nine o'clock, when we were running between 50 and 60 miles an hour, I noticed Kinney, the conductor, in the smoking compartment. Suddenly there was a terrific crash, smashing of timbers and creaking of steel. Then suddenly everything was dark and a death-like stillness followed. But it was for a second only. Immediately afterwards the stillness was broken by the cries of the injured and dying. Shrieks and groans horrified the passengers who had escaped. The cars telescoped each other. The forward trucks of each car were welded together. As soon as possible, those of us who were uninjured, helped the living victims who were buried in the wreckage and carried the dead from the scene of the catastrophe. Motorman George Reed was pinned between the vestibules of the two cars so solidly that it was impossible for us to remove his body. As far as I could determine the accident occurred on a straight-away track. There was no reverse made by the motorman to check the speed of the east-bound car. I was told that the west-bound car was at a standstill. Many of those injured in the wreck were taken to hospitals in Gary and Michigan City. Interestingly, all but one individual killed in the collision were riding in the smoking compartment located at the front end of eastbound train No. 59. This particular space had originally been designed for use as a baggage and freight compartment, but was later converted to a passenger smoking room. One can speculate as to whether the death toll would have been much lower if that space had remained a baggage and freight compartment. Railroad employees and residents living nearby quickly removed the debris from the track so that rail traffic could continue between Chicago and South Bend. Within two hours of the wrecking crew's arrival, all debris had been removed from the Lake Shore right-of-way, piled, doused with kerosene, and burnt. The heavily damaged passenger cars were pulled to a nearby sidetrack. 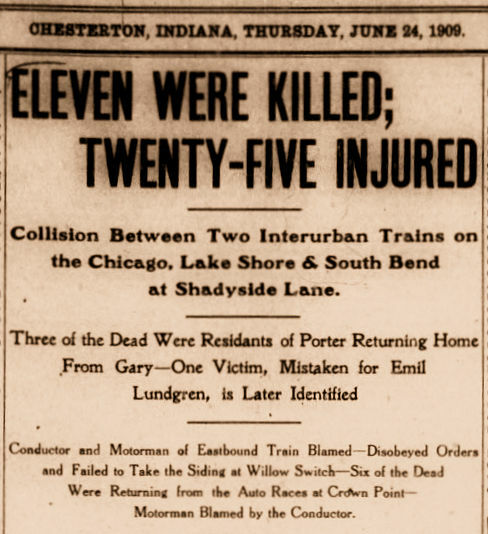 On Sunday morning, June 20, Porter County Coroner Joseph C. Carson arrived in Chesterton to view the remains reposed at the town hall; he also ventured to observe the scene of the collision. Carson authorized Lundberg to prepare all the bodies for burial and to notify families of the victims - if that information was ascertainable. Lundberg numbered each body and placed all contents found on each body in a corresponding numbered bag. With the exception of one victim, all decedents were identified by papers they were carrying with them at the time of the crash. Two passengers that survived the wreck would shortly succumb to their injuries. BARBER, Henry A. - Aged 30 years. Resident of Mishawaka, St. Joseph County, Indiana. Barber was a sales agent for automobile companies. Sustained skull fractures and internal injuries. Killed instantly. Death certificate indicates that Henry's remains were removed to a cemetery located in Danbury, Fairfield County, Connecticut. GILBERTSON, Edward Anton - Aged 40 years. Resident of Porter, Porter County, Indiana. Death certificate indicates that Gilbertson sustained mangled limbs and a skull fracture. 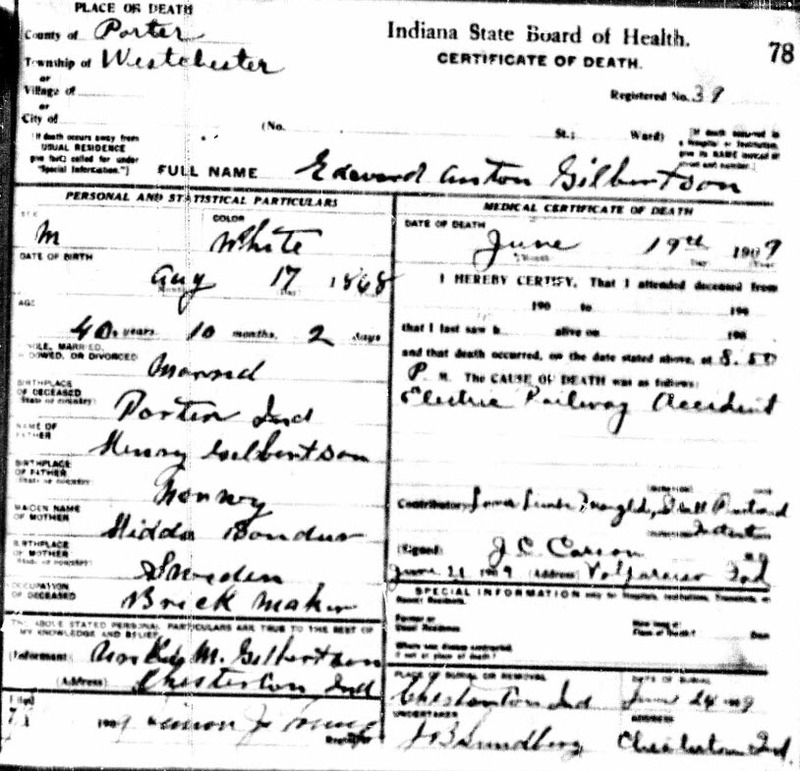 Funeral service took place at the Gilbertson residence on June 24, 1909, followed by burial at Chesterton Cemetery located in Chesterton, Porter County, Indiana. Gilbertson's wife, Reka M. (Hallberg) Gilbertson, would receive a settlement from the Lake Shore in the amount of $5,000, plus reimbursement of all funeral costs, burial clothing, and burial lot. GONDECK, Michael - Aged 37 years. 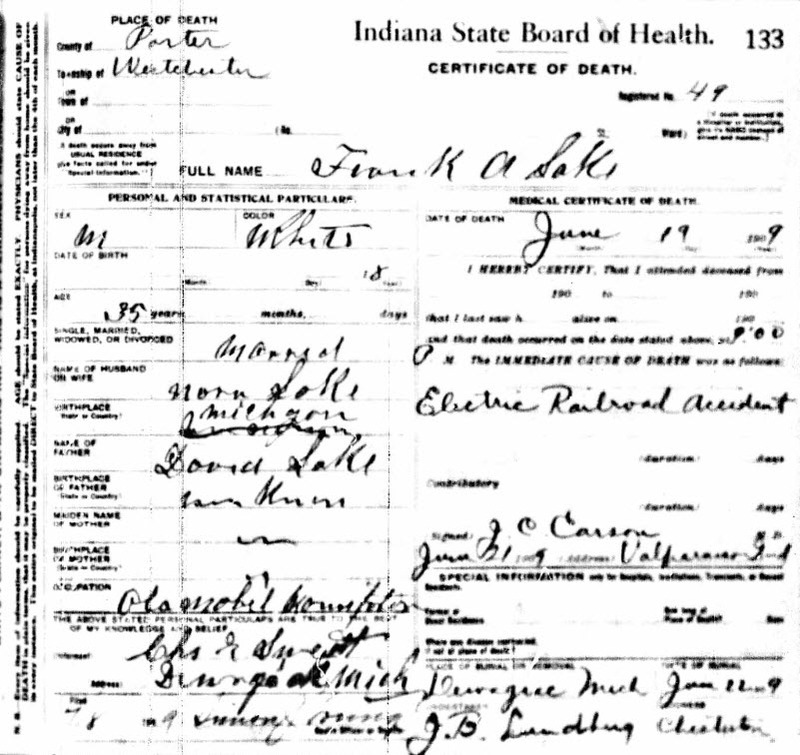 Died Wednesday, June 23, 1909, at Mercy Hospital in Gary. Gondeck was traveling to Michigan City to visit family members; he was married and had four children. 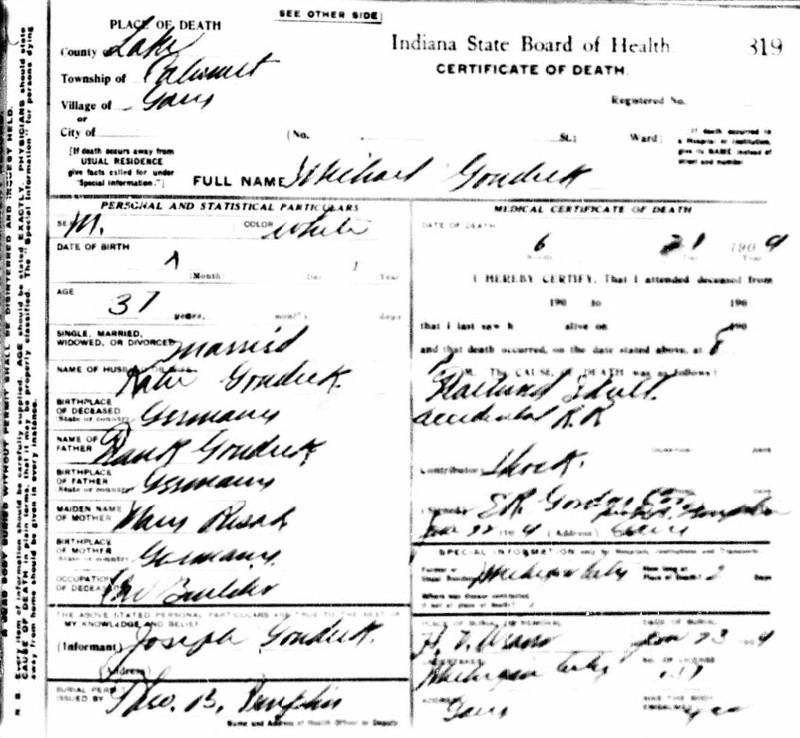 Death certificate indicates that Gondeck suffered a skull fracture. Resident of Michigan City, LaPorte County, Indiana. Interred at St. Stanislaus Cemetery located in Michigan City. 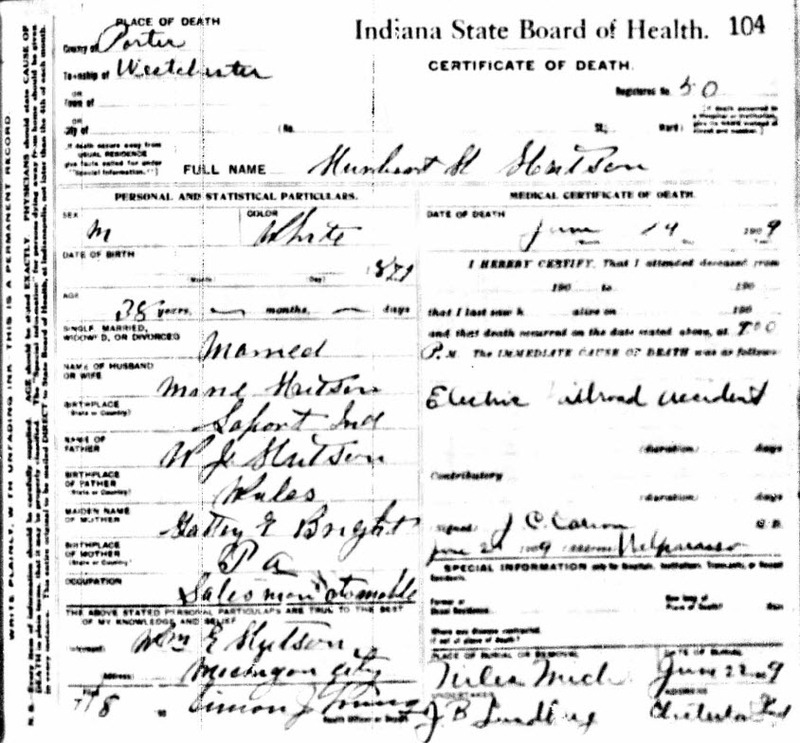 Note that newspaper reports and death certificate provide a given name of Michael, while tombstone is engraved with Nicholas. HUTSON, Herbert H. - Aged 38 years. Killed instantly. Resident of Niles, Berrien County, Michigan. 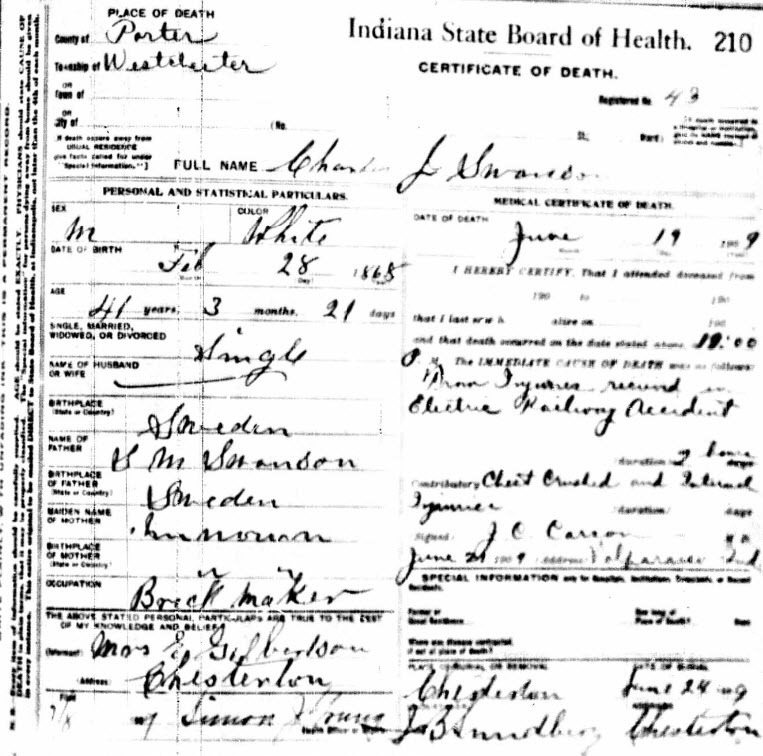 Death certificate indicates that Hutson was buried on June 22, 1909, at Silverbrook Cemetery located in Niles. JOHNSON, Charles G. - Aged 47 years. Resident of Porter, Porter County, Indiana. Sustained a crushed skull. Funeral service and burial took place on June 23, 1909, at Burstrom Cemetery located in Baillytown, Porter County, Indiana. Johnson's wife, Christine (Lindeen) Johnson, would receive a settlement from the Lake Shore in the amount of $5,050. LAKE, Frank A. - Aged 35 years. Resident of Dowagiac, Cass County, Michigan. Killed instantly. Vice President of the Dowagiac Motor Car Company. 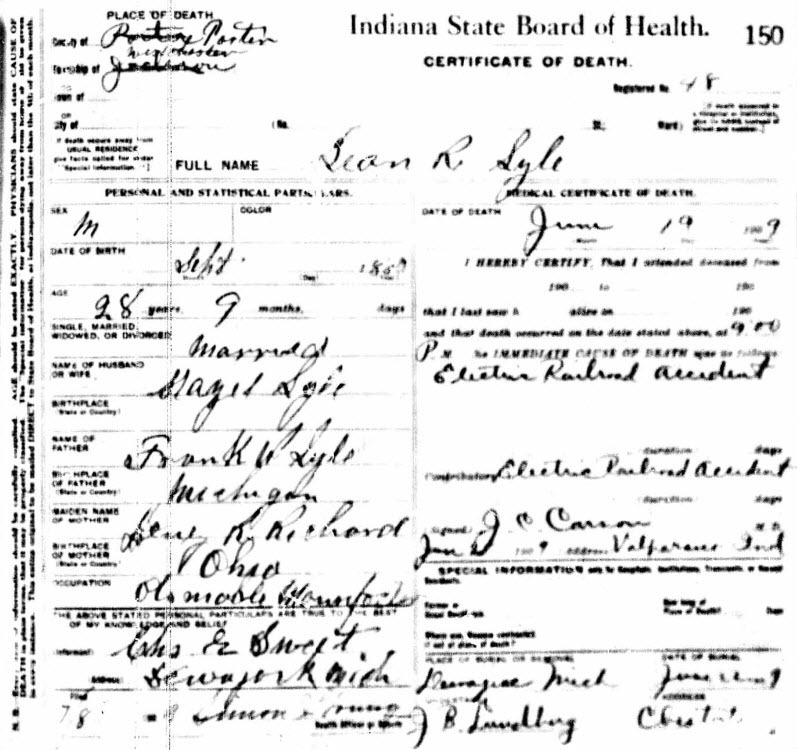 Death certificate indicates that Lake was buried on June 22, 1909, at Riverside Cemetery located in Dowagiac. LYLE, Leon Richards - Aged 28 years. Resident of Dowagiac, Cass County, Michigan. Killed instantly though death certificate fails to indicate specific cause of death. Secretary and Treasurer of the Dowagiac Motor Car Company. Buried at Riverside Cemetery located in Dowagiac. McDONALD, James J. - Aged 22 years. Resident of 5414 Honore Street, Chicago. Employed as a teller for the Chicago Trust & Savings Bank. McDonald had attended the Cobe Cup Race and was traveling to visit friends at South Bend. Sustained skull fracture, crushed chest, and fractured left leg. 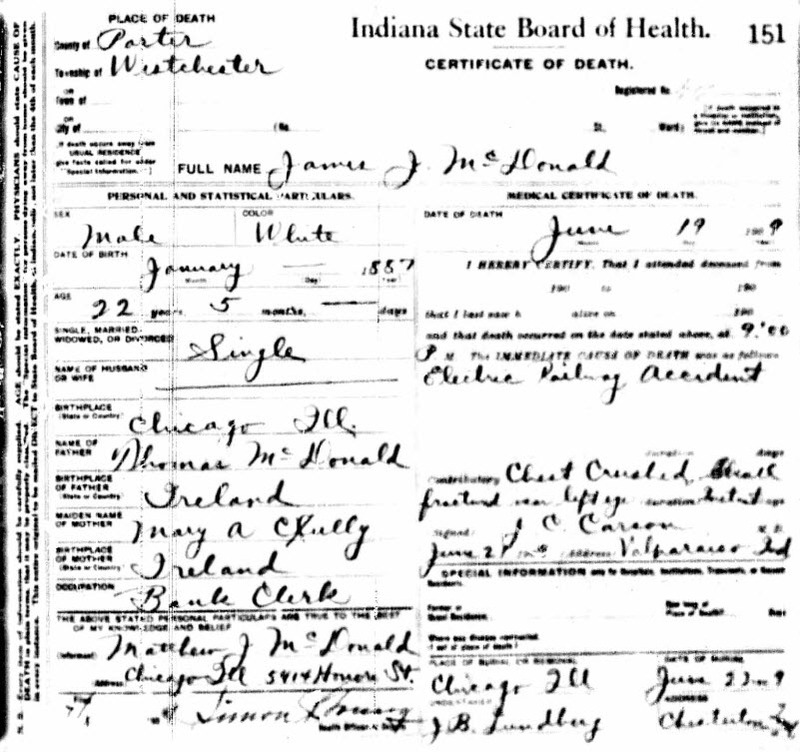 Death certificate indicates that James' remains were removed to a unnamed cemetery located in Chicago and buried on June 22, 1909. MERRIMAN, Ray F. - Aged 27 years. 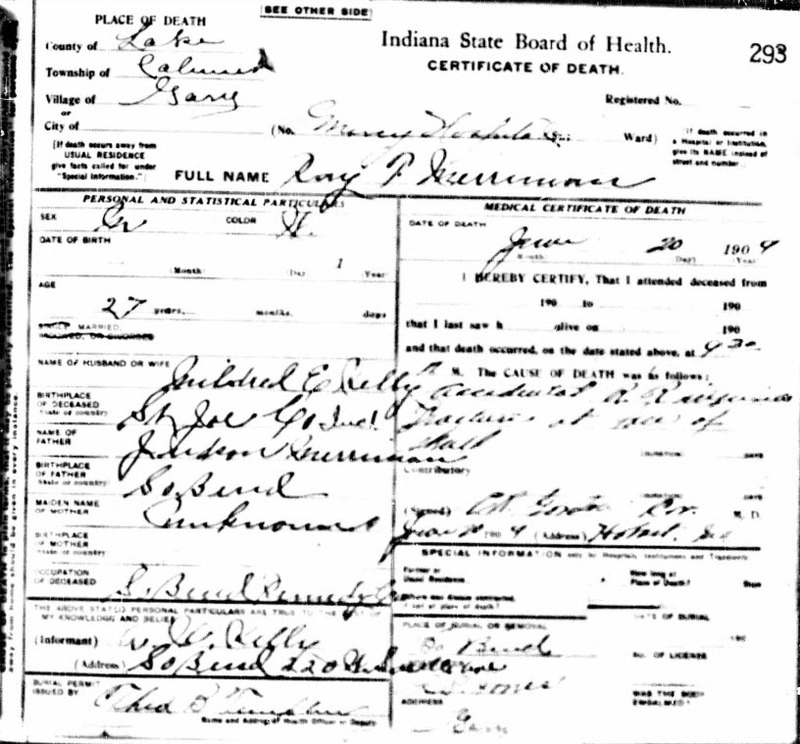 Death certificate indicates that Merriman died at Mercy Hospital located in Gary, Lake County, Indiana, on Sunday, June 20, 1909, succumbing to a fracture at the base of his skull. He was newly married at the time of his death. Buried in Riverview Cemetery located in South Bend, St. Joseph County, Indiana. MOORE, Edward T. - Aged 50 years. Resident of Hillsdale, Hillsdale County, Michigan. Moore was a sales agent for automobile companies in Michigan. 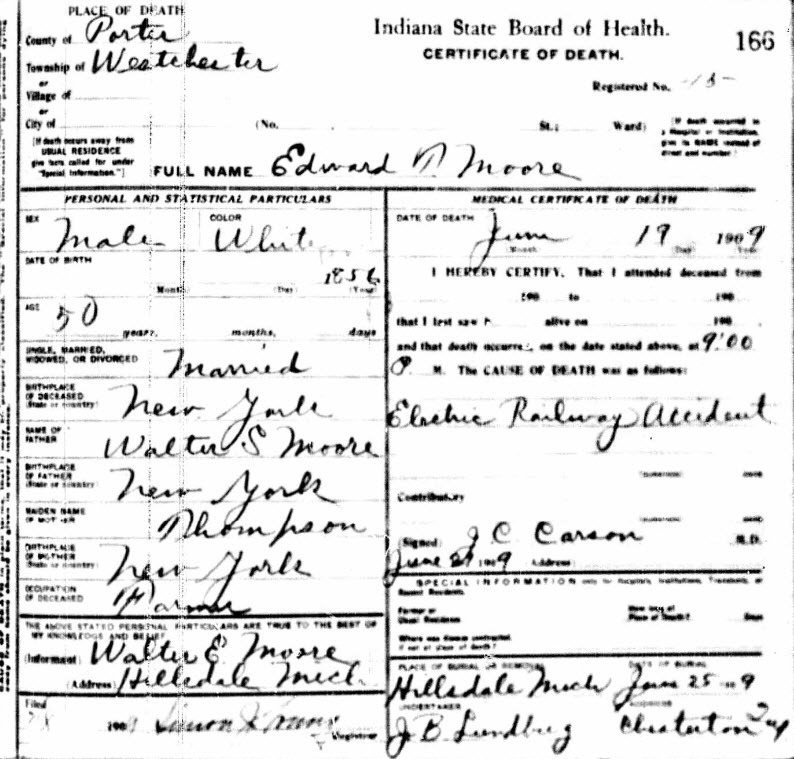 No specific cause of death appears in Moore's death certificate. Buried on June 25, 1909, at Oak Grove Cemetery located in Hillsdale. REED, George Andrew - Aged 28 years. Resident of Villa Grove, Douglas County, Illinois. Motorman of eastbound train No. 59. Body crushed, arm and leg amputated by impact. 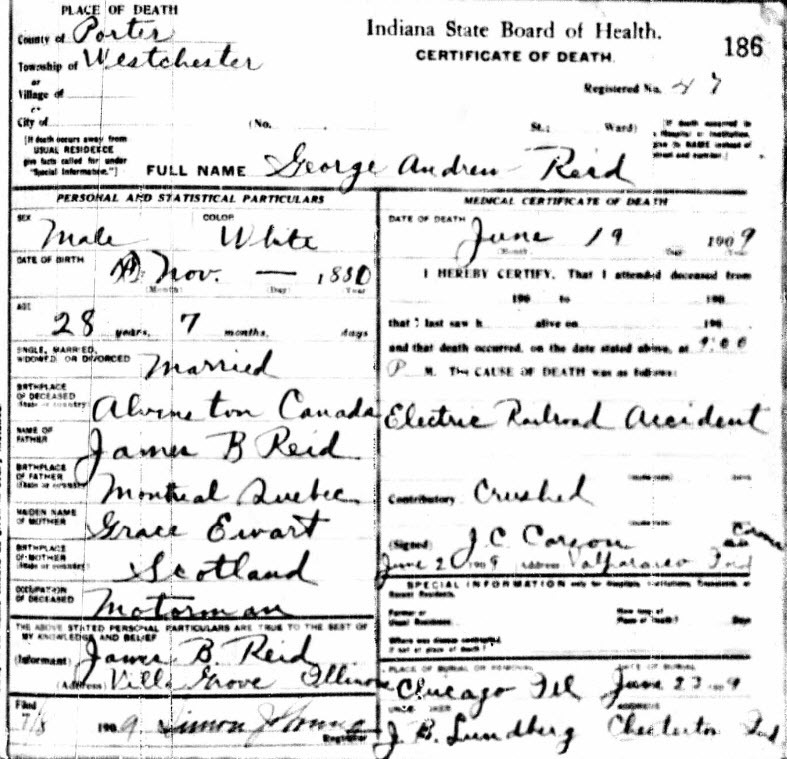 Death certificate indicates Reed's cause of death simply as "crushed." Buried on June 23, 1909, at Mount Hope Cemetery located in Chicago. SWANSON, Charles "Carl" J. - Aged 41 years. Resident of Porter, Porter County, Indiana. Death certificate lists cause of death as crushed chest and internal injuries. Buried on June 24, 1909, at Chesterton Cemetery located in Chesterton, Porter County, Indiana. AUSTIN, Edward - Resident of Michigan City, LaPorte County, Indiana. Gash on head. BARNUM, George Homer - Resident of Knox, Starke County, Indiana. Not injured, but sick from sight of blood and the injured. Taken to Epworth Hospital in South Bend. BROTHERS, B. E. - Resident of South Bend, St. Joseph County, Indiana. Broken leg. BRUEGGER, Donald - Resident of 909 Wilcox Avenue, South Bend, St. Joseph County, Indiana. Son of Mrs. Mary Bruegger. Left leg broken. Treated at Michigan City hospital. BURLINGAME, Edward W. - Resident of Gary, Lake County, Indiana. Broken nose and head bruised. Taken to Gary hospital. CALVERT, Everett B. - Resident of 1012 Colfax Avenue, South Bend, St. Joseph County, Indiana. Bruises. Treated at Michigan City hospital. ERICKSON, Adolph - Resident of Porter, Porter County, Indiana. Badly injured by cuts on head and face. Taken to Gary hospital. GAFFENBERGER, Esther - Resident of South Bend, St. Joseph County, Indiana. Both ankles sprained. HAGELS, Albert - Resident of Michigan City, LaPorte County, Indiana. Arm broken. HEATH, Frank or Fred - Resident of Chesterton, Porter County, Indiana. Slightly injured, scratched, and suffered from shock. HERSHEY, Rose - Resident of Goshen, Elkhart County, Indiana. Bruised and severely cut by glass. JOHNSON, Arthur "Art" L. - Resident of Route 1, Chesterton, Porter County, Indiana. Serious skull fracture, hip broken, bruised. Death was expected due to injuries suffered from wreck. Treated at Michigan City hospital. KEENE, Secordus - Resident of South Bend, St. Joseph County, Indiana. Badly cut on legs, face cut and bruised. KELLY, Richard - Resident of 308 South Williams Street, South Bend, St. Joseph County, Indiana. Injured about head and face. Injuries not serious. Treated at Michigan City hospital. KERRIGAN, Paul - Resident of Michigan City, LaPorte County, Indiana. Cuts and bruises. Not taken to a hospital. KINNEY, Delmar - Resident of Michigan City, LaPorte County, Indiana. Scalp wound one inch long, two left ribs fractured, right arm broken, and right leg crushed. Conductor on eastbound train No. 59. Treated at Epworth Hospital in South Bend. LAWSON, Mamie - Resident of Chesterton, Porter County, Indiana. 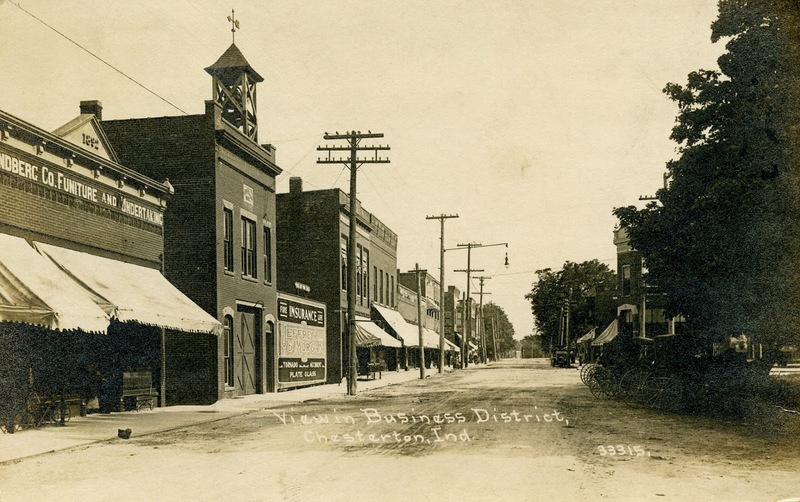 Lawson was returning to Chesterton from her place of employment as a stenographer at Tolleston, Lake County, Indiana. Internal injuries. Initial reports indicated that Lawson's injuries were so severe that she would likely die. LEIN, A. - Resident of Stevensville, Berrien County, Michigan. Son of Henry Lein. On leg seriously sprained. Treated at Michigan City hospital. LORSE, T. W. - Aged 51 years. Resident of Mishawaka, St. Joseph County, Indiana. Chest concussion. Taken to Epworth Hospital in South Bend. LUCE, T. W. - Resident of Knox, Starke County, Indiana. Facial artery cut, cheek bone splintered, and numerous cuts on body. MANTOFFEL, Louis - Resident of East Gary, Lake County, Indiana. Broken nose. MENDYKE, Stella - Resident of South Chicago, Cook County, Illinois. Slightly injured. MILLER, John F. - Resident of 312 Baltimore Street, Michigan City, LaPorte County, Indiana. Leg broken, lip and chin cut, and head injury. Injuries serious. Treated at Michigan City hospital. MOORE, J. - Resident of Hillsdale, Hillsdale County, Michigan. Scalp injured. Injury not serious. Taken to Gary hospital. MYDEK, Mary - Resident of South Chicago, Cook County, Illinois. Nose injured. Not taken to a hospital. NISSEN, Charles - Resident of Tolleston, Lake County, Indiana. Head, back, and shoulder injuries. Injuries not serious. Treated at Michigan City hospital. PEO, L. V. - Resident of 125 Franklin Street, Michigan City, LaPorte County, Indiana. Grandson of Mrs. Patrick Murkiff. Both legs broken (one broken in three places), but no internal injuries. Treated at Michigan City hospital. PHILLIPS, A. C. - Resident of Chicago. Cut on head. PHILLIPS, Mrs. A. C. - Resident of Chicago. Cuts and bruises. ROBERTSON, George Aaron - Resident of Sidney, Shelby County, Ohio. Cut and bruised on head. ROBERTSON, Mame - Resident of Sidney, Shelby County, Ohio. Cut on head and broken nose. RODERICK, Meyer - Resident of South Bend, St. Joseph County, Indiana. Severely cut. SAWACKI, Fred - Resident of 1909 Franklin Street, Michigan City, LaPorte County, Indiana. Slight scalp wound. Not taken to a hospital. SCHIMMEL, Fred - Resident of 1127 Spring Street, Michigan City, LaPorte County, Indiana. Son of Mrs. H. Schimmel. Back and knee injured, but no fractures. Motorman of train No. 58. SCHOLLY, Mrs. A. B. - Resident of South Bend, St. Joseph County, Indiana. Left eye bruised and right leg lacerated. SIMONS, C. A. - Resident of Mishawaka, St. Joseph County, Indiana. Sprained back and broken legs. Dr. Axe was quoted in newspapers stating the "I found Simons lying flat on the ground, and he had rolled a big stone on each side of his broken legs to prevent the throbbing and stop the flow of blood. When I stopped to bind his shattered limbs he said, 'Doctor, I can get along with these stones for some time, and I want the injuries of everybody else attended to before you do anything for me. There are dozens who are worse off than I am." STUTZMAN, Maude E. - Resident of Mishawaka, St. Joseph County, Indiana. Hole cut in back of head, face severely cut by glass. TUCKER, F. L. - Resident of Mishawaka, St. Joseph County, Indiana. Cut and bruised. WILSON, Paul - Right leg broken and bruises. Treated at Michigan City hospital.Wilson was the Assistant General Manager of the Chicago, Lake Shore & South Bend Railroad Company and was a passenger in eastbound passenger train No. 59. WORDINE, George - Resident of Michigan City, LaPorte County, Indiana. Leg bruised. WURSCH, Fred - Resident of 1270 Michigan Street, Michigan City, LaPorte County, Indiana. Chest crushed, scalp wound on back of head. Injuries not serious. Treated at Michigan City hospital. The Railroad Commission of Indiana would soon conduct an investigation of the Lake Shore accident. The Commission's official report states that Conductor Kinney of train No. 59 had received the third dispatch order from the station agent at Gary indicating that his train would meet westbound train No. 58 at the Wilson stop. Kinney, when interviewed by the Commission, readily admitted to receiving the dispatcher's order from the station agent. Kinney also testified that he delivered the dispatcher's order to Motorman George A. Reed, but the Commission's report states that "Kinney cannot be believed." Neither the copy of the order given to Kinney nor the duplicate supposedly delivered by Kinney to Motorman Reed, whose clothing was thoroughly searched after the crash, was ever found. The Commission states that it was plausible that the written order was lost at the site of the accident and that Kinney and Reed had simply overlooked the order. Kinney stated to the Commission that he noticed when he had passed Wilson, and put on the emergency brake in the toilet room, and sounded the emergency stop, three bells twice, but the fact that he stopped at Dune Parke, east of Wilson, and started up again, coupled with all we have learned about him, shows that his statement is false; the chief and awful fault and crime are his, and if there is any way under our laws to prosecute and convict him, it should be done. He may have been sick, and may have been drinking; in fact, from the manner in which he quarreled with passengers and failed to take up fares, he was mentally and physically incapacitated to perform his duties that night, and should not have been on the road if he was ill, or had been drinking. The order was given to him, and he overlooked, forgot, disobeyed; and primarily he is responsible for the death of ten innocent people. 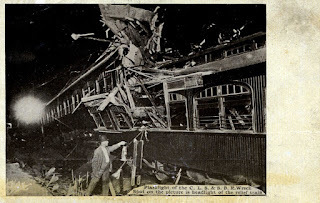 Despite placing blame on Conductor Kinney for the collision and essentially calling him a liar, the Commission also concluded that the management of the Chicago, Lake Shore & South Bend Railway was partially responsible for the wreck. The company was failing to properly manage its growth and was ignoring important issues related to the hiring and training of employees. Upon investigation of company records, the Commission found that only 11 of 48 motorman and conductor applications involved a background check. In other words, 37 individuals were put to work on the line "without the company receiving any replies from persons formerly employing these men." In fact, nine of these 37 men had never submitted a formal written application for employment. Digging deeper into the employment records of the Lake Shore, several examples were discovered of men that should never been hired as either motormen or conductors. For instance, one man had been dismissed by the Wabash Railroad "for violation of Rule G, which is the frequenting of saloons and the use of intoxicating liquor." This man was still employed by the Lake Shore at the time of the investigation of the wreck at Shadyside Crossing. Another man in the employ of the Lake Shore was found to have been recently dismissed for a collision that he was found responsible for near Carthage, Hancock County, Illinois. Take also the case of Reed, who was killed in this accident. While Reed was regarded by his companions as a good railroad man, and while he has gone to his final account, it is true of him that he was discharged from a steam railroad for burning an engine, a serious neglect that might have caused the explosion of the boiler and the consequent death of many persons. Almost every day green hands at the motor handle are seen racing their cars with the Lake Shore flyers, which they invariably outspeed. The customary interurban speed is 75 to 80 miles an hour, with spurts at the rate of 90 miles, while the fastest flyers on the steam road make 70 miles at the most. That the personal and past record of all men who may apply for positions as trainmen, shall be scrutinized carefully; that full files be kept of applications and recommendations, and replies to inquiries about them; and that no person shall be employed for the position of motorman or conductor on said railroad until after the most careful investigation has been made, with satisfactory results. This personal record should be kept so as to show the condition of the same without difficulty or delay whenever an investigation is being made, or when there is any need for it for any purpose. I would, therefore, place the entire responsibility of said wreck, with its dire results, upon the mismanagement in the operation of Train No. 59, Car No. 73, for disobeying said Train Order 442, in not taking the siding at Wilson as the said order clearly specified and directed. 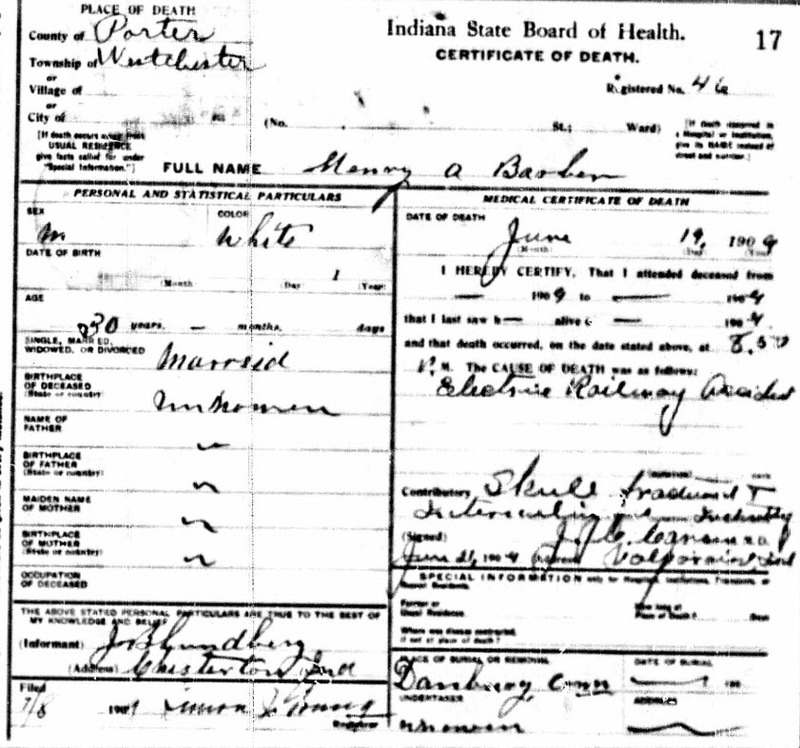 The deaths of Henry A. Barber, Herbert H. Hutson, Leon R. Lyle, and Frank A. Lake could be considered a product of fate. 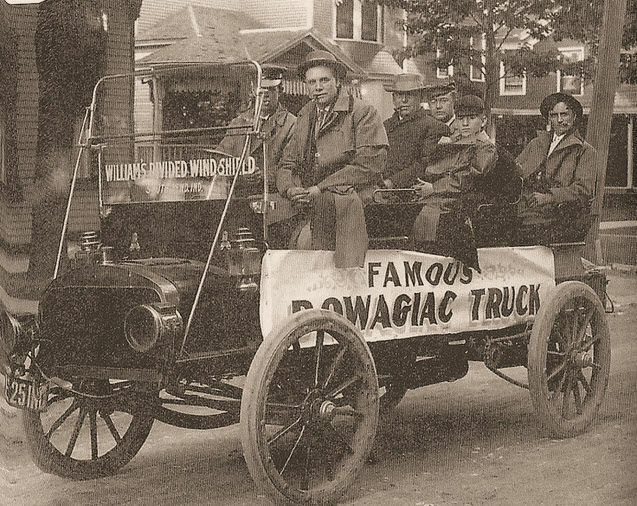 All four men had been promoting a truck manufactured by the Dowagiac Motor Car Company, a automobile manufacturer co-owned by Messrs. Lake and Lyle. On June 18, 1909, the men had been in LaPorte and Valparaiso publicizing their truck. Their vehicle broke down in Valparaiso, however, which necessitated repairs. The four men proceeded to the Cobe Cup Race in the southern half of Lake County. After the race, the men continued on to Hammond where they boarded the South Shore's eastbound train to return to Dowagiac, Cass County, Michigan. The men sat in the train's smoking car and were killed instantly by the force of the collision. Indiana, one day prior to four of these passengers being killed at Shadyside Crossing. In the front of the vehicle are Frank A. Lake (left) and Herbert H. Hutson. Seated in the middle of the vehicle are Robert Atkinson (left) and Harry Huston. return trip to Dowagiac, Cass County, Michigan, by taking the Michigan Central Railroad. Source: Arseneau and Thompson, Images of America: Dowagiac. Another incident in connection with this wreck was related by the Sisters of Mercy hospital yesterday afternoon, after the death of Ray F. Merriam [Merriman] of South Bend. This young man had ridden on the cars with them from Gary to Hammond a short time ago and paid their fares, although a perfect stranger. When he did this he remarked: "I never allow a Sister to pay a car fare on a train that I am riding on. It may be that they will have a chance to take care of me some time, and I will have to depend upon them for assistance." As soon as he was brought into the hospital dying from his injuries he was recognized by the Sisters as the man who had paid their fares. The death, injury, and damage claims resulting from this collision led to a change in management for the railroad and the installation of automated signals. By October 1909, Charles N. Wilcoxon was appointed the General Manager of the Chicago, Lake Shore & South Bend Railway. When Wilcoxon was elected President of the company in June 1914, the railroad's debts exceeded $120,000 solely due to court-ordered judgments arising from assorted injuries and deaths on the rail line, which is the equivalent to nearly $3 million in 2017. Claims resulting from the Shadyside Crossing wreck alone reportedly exceeded $80,000. Incidentally, Charles N. Wilcoxon would later murder his wife, Hettie Elizabeth (Todd) Wilcoxon, beating her over the head with an axe and potato smasher, and then commit suicide by hanging himself in 1924 at Michigan City. The couple had been involved in an automobile wreck on U.S. Route 12 earlier in the day and it was surmised that "The shock of the accident ... precipitated Wilcoxon's loss of mind." murder-suicide at Michigan City, LaPorte County, Indiana. Source: The Muncie Evening Press, July 9, 1924. The Lake Shore would continue operating its interurban line, but always struggling under considerable debt. In 1925, industrialist Samuel Insull purchased the bankrupt Lake Shore line and reorganized it as the Chicago South Shore & South Bend Railroad. Similar to its predecessor, the name of the railroad was often referred to by a shortened name - the South Shore. The railroad remains in existence and is the last of the hundreds of interurban lines that once operated in the United States. Remarkably, one of the passenger cars involved in the Shadyside Crossing wreck, Motorcar No. 73 representing eastbound train No. 59, still exists. Motorcar No. 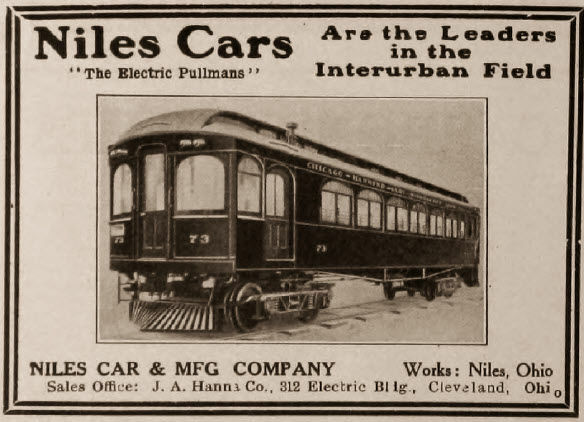 73 was constructed by the Niles Car & Manufacturing Company located in Niles, Trumbull County, Ohio, in 1908. 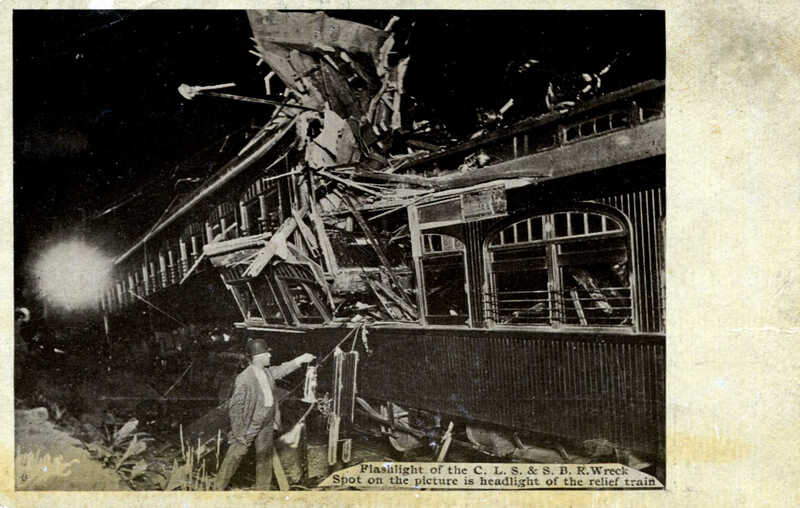 The 1909 collision had resulted in about one-half of the car being ripped off its underframe. A railroad company would typically scrap such a heavily damaged car. The Lake Shore, however, was under significant financial stress. Instead of purchasing a replacement car at cost of about $20,000, the company decided that it could rebuild Motorcar No. 73 for approximately $7,000. The rebuilt car, using the same car number, reentered service in 1910 on the Lake Shore line. In 1927, Motorcar No. 73 was retired from passenger service and rebuilt as Work Motor No. 1126 on the South Shore line. As a work motor, the car was used in various capacities until it was finally retired from service in 1941. The purchaser of the scrapped car used it as a house, and it remained relatively unchanged through the mid-1980s when it was purchased in 1984 by Bob Harris of the RAIL Foundation. The car was put into storage for many years, but has recently been undergoing a complete restoration in Murphysboro, Jackson County, Illinois. One can view the progress of the restoration on a Facebook page dedicated to this rail car. Motorcar No. 73 in service on the Chicago, Lake Shore & South Bend Railway. Source: Central Electric Railfans' Association, 1960. [see p. I-10]. Arseneau, Steven, and Ann Thompson. 2005. Images of America: Dowagiac. Charleston, South Carolina: Arcadia Publishing. 128 p.
Central Electric Railfans' Association. 1939. Chicago South Shore & South Bend Railroad. Bulletin 4. Chicago, Illinois: Central Electric Railfans' Association. 12 p.
Central Electric Railfans' Association. 1960. Electric Railways of Indiana. Bulletin 104. Chicago, Illinois: Central Electric Railfans' Association. Unpaginated. Orogrek, Cynthia L. 2012. Images of America: Along the Chicago South Shore & South Bend Rail Line. Charleston, South Carolina: Arcadia Publishing. 127 p.
Railroad Commission of Indiana. 1910. Accident Report No. 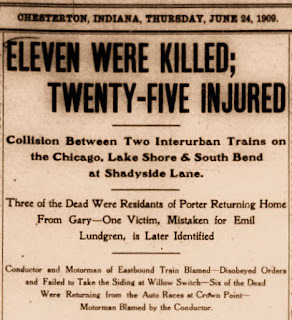 4: In the Matter of Investigation of Fatal Accident on the Chicago, Lake Shore and South Bend Railroad near Chesterton, Indiana, June 19, 1909, at 9:15 p. m. In Fourth Annual Report of the Railroad Commission of Indiana 1909 (pp. 399-406). Indianapolis, Indiana: William B. Buford. 656 p.
Anonymous. 1908. Personal Mention. Electric Railway Review 19(9):279. Anonymous. 1909. 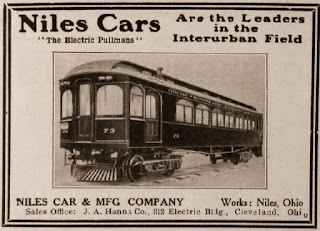 Niles Car & Manufacturing Company [Advertisement]. Electric Traction Weekly 5(2):30. The Butte Miner, Butte, Silver Bow County, Montana; June 20, 1909; Volume 46, Number 276, Page 1, Column 3. Column titled "15 Dead, 25 Hurt in Electric Car Wreck in Indiana." The Detroit Free Press, Detroit, Wayne County, Michigan; June 20, 1909; Volume 74, Number 268, Page 1, Column 2. Column titled "15 Die in Car Crash." Fort Wayne Journal-Gazette, Fort Wayne, Allen County, Indiana; June 20, 1909; Page 1, Column 1 and Page 4, Column 7. Column titled "Fifteen are Dead and Twenty-five are Injured in Traction Wreck." The Indianapolis Sunday Star, Indianapolis, Marion County, Indiana; June 20, 1909; Volume 7, Number 15, Page 1, Columns 6-7. Column titled "Extra. Fifteen Dead, 25 Hurt in Traction Car Crash." The Muncie Sunday Star, Muncie, Delaware County, Indiana; June 20, 1909; Volume 32, Number 53, Page 1, Column 7. Column titled "Fifteen Dead in Car Wreck. Interurbans Collide on South Shore Electric Line, Near Chesterton, Ind." The New York Times, New York, New York County, New York; June 20, 1909; Volume 58, Number 18775, Page 1, Column 6. Column titled Twelve Killed in Wreck?" Belvidere Daily Republican, Belvidere, Boone County, Illinois; June 21, 1909; Volume 17, Number 146, Page 1, Columns 1-3. Column titled "Catastrophe on Electric Road Worst in History." The DeKalb Daily Chronicle, DeKalb, DeKalb County, Illinois; June 21, 1909; Volume 13, Number 181, Page 3, Column 5. Column titled "Inquest Over Wreck Victims." The Inter Ocean, Chicago, Cook County, Illinois; June 21, 1909; Volume 38, Number 89, Page 4, Column 1. Column titled "Blames Wreck on Motorman, Killed." The Lake County Times, Munster, Lake County, Indiana; June 21, 1909; Volume 4, Number 3, Page 1, Columns 1-2 and Page 5, Columns 6-7. Column titled "12 Dead: Score Hurt. Electric Cars in Collision." The Muncie Evening Press, Muncie, Delaware County, Indiana; June 21, 1909; Volume 9, Number 70, Page 2, Columns 3-4. Column titled "Orders Were Not Obeyed." The Pittsburgh Post, Pittsburgh, Allegheny County, Pennsylvania; June 21, 1909; Volume 67, Page 1, Column 1 and Page 3, Column 1. Column titled "Big Electric Cars Collide, Killing Ten." 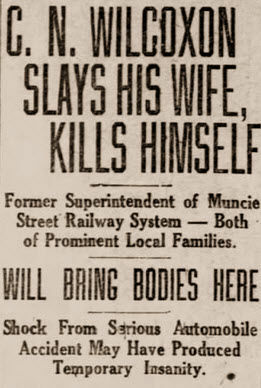 The Indianapolis Star, Indianapolis, Marion County, Indiana; June 22, 1909; Volume 7, Number 17, Page 4, Column 2-3. Column titled "Conductor Silent on Wreck Details." The Lake County Times, Munster, Lake County, Indiana; June 22, 1909; Volume 4, Number 4, Page 1, Column 1. Column titled "Another Victim Dies Last Night." The Richmond Palladium, Richmond, Wayne County, Indiana; June 22, 1909; Volume 34, Number 225, Page 3, Column 1. Column titled "Conductor Very Silent on Wreck of Traction Car." The Chesterton Tribune, Chesterton, Porter County, Indiana; June 24, 1909; Volume 26, Number 13, Page 1, Columns 3-4 and Page 2, Columns 2-3. Column titled "Eleven Were Killed; Twenty-Five Injured." The Chesterton Tribune, Chesterton, Porter County, Indiana; July 1, 1909; Volume 26, Number 14, Page 1, Column 3 and Page 4, Columns 4-6. Column titled "Neglected the Order." The Chesterton Tribune, Chesterton, Porter County, Indiana; July 1, 1909; Volume 26, Number 14, Page 1, Column 4. Column titled "Two Claims Settled." The Muncie Evening Press, Muncie, Delaware County, Indiana; July 9, 1924; Volume 32, Number 251, Page 1, Column 2. 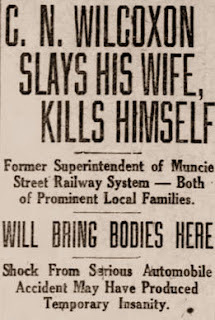 Column titled "C. N. Wilcoxon Slays Wife, Kills Himself." Florence Tiemann drove her automobile across the Baillytown tracks near US Route 12 colliding with a South Shore train on November 12, 1938. Three girls in the automobile died instantly as a result of the collision: Jean Tiemann (age 2), Evelyn Tiemann (age 16), and Maxine Coonrad (age 13). Florence suffered critical injuries to her head and body but survived; she passed away on September 19, 1975, in Ocala, Florida. I've been unable to find any information concerning crossing arm legislation that is attributed to the Tiemann wreck.